Authors James G. Turner and Joy Juhas’s newly released “Joyful Imagination” is a collection of touching poems. 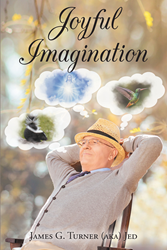 “Joyful Imagination” from Christian Faith Publishing authors James G. Turner and Joy Juhas is a compilation of poetry. The poems were written by the late author James G. Turner and compiled by Joy for the reader’s enjoyment. “Joyful Imagination”: shows the skill of Turner through a series of poems covering a variety of themes. “Joyful Imagination” is the creation of published author, James G. Turner and compiled by Joy Juhas. James G. Turner was born during the Great Depression which affected the way the author lived life after. “There’s Michele, who is the oldest. Then comes Mark, he’s number two. Jodi, she is the next in line, she will say a prayer for you. Joy will take the pictures that will brighten up your day. Jed has been there the longest, he will show us where to stay. Sherry Lee will have a story, exaggerated yet quite true. Published by Christian Faith Publishing, this new book is a touching and thought-provoking collection of poems covering a variety of subjects the author held dear. These works enclosed are some of the last of the late author James G. Turner. The author has distilled the life experiences and thoughts collected into a touching series of poems. Inside this book one can find the joy and love that inspired the author. View a synopsis of “Joyful Imagination” on YouTube. Consumers can purchase“Joyful Imagination” at traditional brick & mortar bookstores, or online at Amazon.com, Apple iTunes store, Kobo or Barnes and Noble. For additional information or inquiries about “Joyful Imagination”, contact the Christian Faith Publishing media department at 866-554-0919.